The 2 International SSBD Summer Camp was a HUGE SUCCESS. The response to the Training Camp was amazing. The camp was broken into 2 dates making sure the number of participants was below 20, to make sure correct instructions was conveyed. 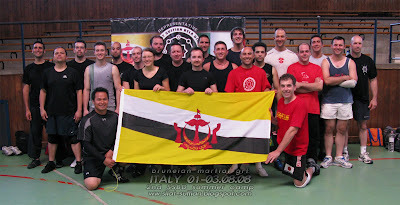 It was organized by Carlo Andreis of the AMADA Martial Arts Academy, and SSBD Group Leader (Italy) in Desenzano Del Garda. It was attended by martial art practitioners and instructors of different nationalities, from nearly half of Europe. There were guys from different parts of Italy, Scotland, Slovenia, Sweden, Finland, Belgium, Czech Republic, Holland, Germany, Brazil, Mexico (US), Peru, etc. Those who came were experienced practitioners and instructors from varied martial arts. Their participation and openness to experience SSBD was a very humbling experience for myself. But what was special about the Training Camp was not the martial arts training itself, but the friendship that was made among each and every participants. To see and trying to stab each other with knives everyday, mutual respects and trust was gained. These are great groups of individuals I call my friends. More pictures and details of the participants Coming Soon.